I always say I live on top of an anthill. Truly, the number of ants in my yard is amazing. They don’t invade my house, but they love to destroy my plants by colonizing them with aphids and scales. I’ve gotten pretty good at controlling aphids but the real problem was the ants putting the aphids on the plants, and I knew it. If I didn’t cut down the number of ants in my yard, this problem would keep coming back year after year. And these ants were maddening. Unlike sugar ants, which will go to any ant bait and take it blithely back to the nest, these ants walked right past the commercial ant traps I put out. And no matter how many times I dumped boiling water on their anthills, there always seemed to be more of them. Finally I did some research and discovered that they are Argentine Ants, an invasive species that can be found all over the United States, especially California where I live. They are sometimes called piss ants. So what do you know, I really WAS living on top of an anthill. The multiple queens also explained why the boiling water didn’t work. Dumping the water on the hill may have killed off a number of ants, even the queen, but there were eight more to take her place. The answer to my problem was Borax. This white powder is sold in most grocery stores and is a common ingredient in cleaners. One box costs about $5. I used the following recipe and the ants were so excited about it that they stopped colonizing my Jerusalem artichoke with aphids and concentrated on taking the bait back to the nest instead. Soon enough they had all disappeared. Since then I have used the recipe several other times to the same results. And the best part is, while borax may be poisonous, this trap is set up so that your pets and other wildlife can’t get to it. When dealing with poison of any kind, always wear gloves. In a pot, dissolve the sugar, borax, and water over medium heat until it turns to a paste. Carefully spoon the mixture into and old soda or beer can. This keeps animals out of the bait and protects it from rain. 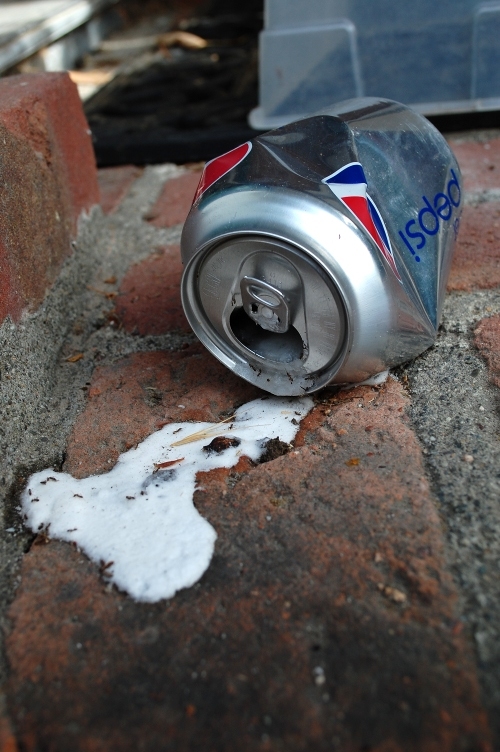 As you can see, I accidentally squeezed the can and some of the baits spilled onto the bricks. Although that sped up the ant’s interest in the bait, I don’t recommend it because it encourages other animals to notice it as well. To protect my cats, I put a plastic tub over the bait. Now nothing can get at it, except the ants. Cool! I remember you mentioning that you had a lot of ants, but didn’t know the extent of your problem… yikes! We’ve used boric acid before on ants, fleas (in the carpet- when we had carpet), and on a small but disturbing population of cockroaches. (That made me cry..) It only works if you don’t misplace the bottle, though..
We discovered last year with an ant invasion in our kitchen that the orange oil air freshener (the stuff that is just orange oil) I was using out of desperation to interrupt the scent trail works awesome to actually kill them. I knew the scent of oranges made me happy for a reason! I like the bait recipe you posted here- it looks like it’s worth the time to put together. Borax is also not as hard on other animals and plant as other types of poison either, which makes it a win in my book. I know that when insects ingest it, it damages their exoskeletons to the point that they simply dehydrate. I’ve read conflicting information of the effects on animals and people, though. Better to play it safe. Hopefully we don’t have to deal with ants at the new house, but here in California, I’ve learned otherwise! Thanks for the recipe! Wow, that’s a great tip. The ants are colonizing our lemon tree, ick. I’ll have to use this. I like the idea of putting it in a can so no other animals will get interested in it. You do realize that what you made is exactly the same as Terro right? except Terro using Corn Syrup instead of sugar water…. @Sarah. It wouldn’t be “exactly the same” if the sugar ingredient is different. This is a great idea, especially since I have Borax on hand that I use to make laundry detergent. I’m also in Southern California, and the area I live in is ridiculous with ants. It’s like we are on a giant ant hill miles wide. I have ant that track inside at the drop of a crumb. They also have come out of the light socket when my husband put something on the counter. I sprayed them with orange oil wood moisturizer, which really worked well, but there is no way I can do this on most surfaces, lol. I will definitely be doing your hint here soon. Cool! My mom gets piss ants all the time and I am going to share this with her. The ants are so annoying! I made this, but when I cooked it, it came out clear, not white like the picture. What am I doing wrong? Thanks. I believe it came out clear for me too and turned white as it cooled down. 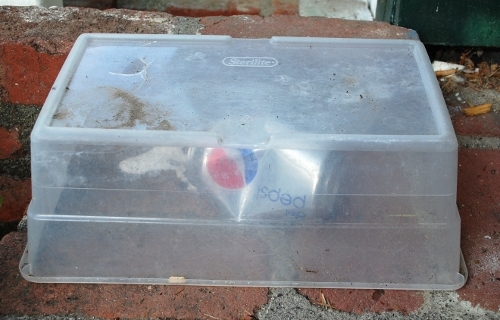 I had a stream of ants yesterday in me yard, made the solution, put out the can and the ants are totally gone today. I’m sold. Thank you. One question, do I remove the can now and make a new batch next time. It’s hardened in the can. Thanks. Jan, I’m glad it worked for you. I have re-used a trap more than once. If the ants don’t take it all, why not? I have ants invading my, Angel Trumphet, Rose of Sharon, and citrus trees on the deck-all near my tomato plants, and i dont want to use a “pesticide” I’m excited to try this, thanks. I live in Montclair where ants had taken over they wondered all over the house. Where should I place the trap in the home? Athena, you could, but Grant’s Kills Ants works really well for indoor ants, plus it’s designed to be around children/pets/etc. I live outside Yucca Valley and get the same little pests like crazy! I wish I had discovered this a few months ago when my daughter’s pumpkin garden started and we were invaded by ants! The pumpkins are just about done growing now, but we have a “fall crop” of watermelons that these ants are absolutely loving, so I am SO pinning this and trying it out ASAP! What will work on box elder bugs. they show up about once a year and they are everywhere. Dee, I doubt it, since box elder bugs aren’t motivated in the same way ants are. Good luck getting rid of them. Where do I get the borax? Is it just the regular 20 mule team borax in the detergent section? We tried this but I think we may have done something wrong. I read all posts, but still a little unclear whether it was safe for the veggie garden? I read it was a poison so I can’t use it if I want an organic garden, correct? I had a ruined tomato crop last year because of the ants, I had holes everywhere and I filled them with everything I could think of and read online….to get rid of them (organically)….I could use your help. I’ve been battling these ants here in Indianapolis for six years. Nothing has worked. My husband had mentioned borax but we were worried about our dogs. Thanks for the tips and for all the info. It’s good to know I’m not alone in dealing with these crazy ants. I’ve used this type of ant bait / killer before and it was the ONLY thing that finally killed them off. I fought them with every known man made product and they still kept coming. I made this once and after about 3 weeks of the little jerks eating it, GONE. It was fabulous, and CHEAP. I live in Georgia and we have fire ants. Does this work on fire ants too? Rhett, yes as long as the bait stays in a can, it is safe for a vegetable garden. Laura, good luck! It’s an ongoing battle. Penny, I had a similar experience. Glad to hear it worked for you too. Martie, we don’t have fire ants here, so it’s hard for me to say. If they are attracted to sugar, I think it’s worth a try. Box Elder bugs- use Dawn (yes, Dawn works the best) dish washing liquid soap in high concentration with water in a spray bottle. Spray on the bugs and it will ‘clean’ the wax off them and makes them unable to move. It will clear off the ones you have and after awhile of using it, they will move onto different grounds. This trick brought to you by the old school farmers of North Dakota where my family was stationed. We have ants around most of our yard, and recently I saw a trail on back porch. So I just bought Ortho Home Defense 12-mo bug/ant killer that I am planning to use in spray container. Wouldn’t this be fine to get rid of (kill off) all these ants trailing about the back porch and around it? Or is Borax much much better..? Thanks. BN, since you bought the Ortho Home Defense already, I say give it a try. Borax is not as toxic and targets the queen of the colony. I don’t know how the other works. Try it and let me know. Savvy, actually I quickly decided to return the Ortho sprays and didnt use them. I was reading that Vinegar is also a good organic option to use for killing ants immediately and for perimeter protection, so I decided I will try it. However it’s been raining n storming so much the past week that I figure there’s no point doing anything until it dries out next week. But I’ve read it two ways: use equal parts vinegar and water; and some pages say simply, put vinegar in spray bottle (with no mention of water). Would you know whether 50/50 vinegar/water is the right way, or is full strength vinegar spray okay? Thanks. Plus I bought corn meal as I’ve read that placing some of this around ant trails and near the nest/mound is another way to kill ants as they take it back to the nest, eat it and die since they cannot digest it. But with the rains all week haven’t done anything yet either. Basically I’ve wanted to find quick ways to kill the ants, since I just want them out of the way while I’m outside standing around cleaning and painting. Plus I wanted to make sure I can use the same spray to prevent them from coming into the house. Otherwise I’d try the borax way. BN, the way to kill ants in almost all cases is to kill the queen. What you have to do is get the ants to bring poison back to her. If she dies, the hive dies. In the case of the borax/sugar bait, they think it’s a tasty treat and bring it back to her, she eats it, dies, and they stop reproducing. That’s why it’s effective. My thought is that cornmeal and vinegar aren’t going to do anything, although you can try it and see. It doesn’t hurt anything either way. Wow, something that may actually work! I, too, live on an ant hill as wide and as long as my front and back yards. And like you, they are not so problematic in my house, but outside is a different story. They destroy my garden and potted plants by creating these HUGE nests just below the surface. And help me if decide to lay down mulch…it is like a pre-fabricated ant condo! I will definitely be trying this out and sticking with it through the summer! Thank you so much for this great advice! I found it just in time when ants are taking over my Florida yard and planters. I didn’t feel like I wanted to use any of the solutions I knew about before. Can’t wait to try your recipe!! This is for Dee Stone’s question about box elder bugs….mix up a slurry of Dawn dishwashing detergent and water, and douse them with it! I use that spray jar that attaches to your hose to do it. They’ll be dead in about 30 seconds after getting sprayed! I’ve had tons of them, and this worked like a champ! This is for BN. I have huge ant hills in my Wisconsin gardens, one of which I got rid of by using Dawn dish detergent in vinegar. I always have vinegar on hand, as I use it in the laundry and also pour it on weeds in the lawn (it does a good job of killing weeds and not grass, just on it’s own). I had about a half gallon of vinegar left in a bottle and I mixed several longggg squirts Dawn into it, swished it around a couple times and poured. No more ants! I have a ant story too beat most. Moved into a newly rented house and wondered about the ant traps everywhere. I saw no ants yet for awhile. In my office room my desk was up close to a window (not opened)mind you, but as I started to type my keyboard came alive with massive amounts of ants pouring out. It looked like during the night they moved in. I had saw just a couple along the window ledge and thought “Oh no” a few days earlier.I wanted to take a picture because no would believe it but you couldn’t see them because the keyboard was black.The land where this neighborhood was built is orchard . Ants are everywhere. I know what you mean when you say you’re sitting on a ant hill. I am going to try this because no matter what I do we can’t get them to go. I have an art studio that is detached from our house. I am having a problem with carpenter ants I think. They are larger than “regular” ants and not the right color for fire ants, a Florida problem. Will this work as well on this colony as well? Thanks! For JULES. I’m in Florida too. Carpenter ants eat termites, so if they’re in your studio, you may need to make sure there are no termites. Look for an accumulation of something looking like black non-pareils (you know the candies of Sno Caps) on the floor or window sills. I live in Norway and we have now Borax. What is Borax used fore? I have been stressing over the infinite amount of ants in my Orange County yard. They are in my potted tomatoes and herbs. There are pots of hibiscus, cala lily, azalea, ferns and orchids. In addition, we have Angel’s Trumpet, apricot, fig, plum, and ginger. Ants, ants, ants! But my most vulnerable area has lemon and orange trees, California lilac and passion flower vines. The passion flowers vines are amazing and are currently occupied by caterpillars that will become a multitude of butterflies that we enjoy every year. This year, the ant infestation seems especially bad and they are tending to aphids on the citrus. They have crossed over to the passion flower vines and seem to be attacking the caterpillars. I thought of the soap method, but don’t want to injure any of the butterfly stages and there are just too many to move during a treatment. Today we will try the borax and sugar cans. I hope, I hope, I hope! That addresses the ants. If anyone has a suggestion to address the aphids without affecting the caterpillars and eggs, please chime in! And Thank YOU!! I am trying this. Mine was clear as well when I cooked it. Ants are new to my yard. I work in the early childhood field and we’ve long made GaK from a mixture of borax, white glue, and water. I am not thinking that something that is used for a sensory toy for young children is toxic to humans at all. In fact, when I read this recipe after my grandson (6) discovered the ants, he was delighted we’d be getting more borax as we’d used all we had on batches of gak. The trip to the store included a bottle of white glue. Set this up on the weekend. I’ve seen lots of ants take the bait, and haven’t seen any inside since I set it up. Seems like it’s too early to have killed them all, but they do seem to not bother coming inside when they can get this outside instead. You can use an old water bottle too with a hole drilled into the lid. I put the poison inside, screw the lid on and voila! Also for fire ants I mix the borax with peanut butter since they are attracted to proteins. They loves that peanut butter! Black ants i have a problem wit i know its summer they come out more, but its so frustrating !! It seems like they are waiting till i sit down to eat not even ten min there all over my drink!!! So wat can i do ???? Steve–I don’t see any reason why you can’t use it inside as well, especially if you don’t have any kids or animals. Give it a try! Denise, I can’t help but wonder if the Borax/peanut butter mixture will work to kill roaches too? I pay a lot for tubes of paste to put out for roaches and this would solve two problems at once. For Devora….I found piles of the Black non-partials that you described. Does that indicate the presence of termites or just carpenter ants? I use this recipe but add a couple of tablespoons of bacon grease. Some ants(like fire ants) like fat. Also roaches like the grease. I also only add enough water to be able to make balls and make teaspoon size balls. I place them in small cans or lids. Lids go under the refrigerator where kids and pets can’t reach. I have no bugs or ants. You can freeze these but mark them POISONOUS. Devil’s advocate ….The tenacity and belligerence of this lil ant species may be admirable to those who live in a world of rounded-off corners and pastel colors….Northeast Miss’ippi is not that world. Tytyty for posting this Borax-based answer that is also simple. I do love me sum simple. These ants are my personal 9th level of Hell. And you are now my favorite person in the world. And I have a hubby and 3 sons. I ended up with a clear liquid… I think I may need clarification of what “enough water to loosen the solution” means… because I have a feeling I put in too much water. Tracy, that’s for this comment. It made my day. I’m curious as to how thick the mixture is supposed to be? Can you give me an approximate amount of water to use please? 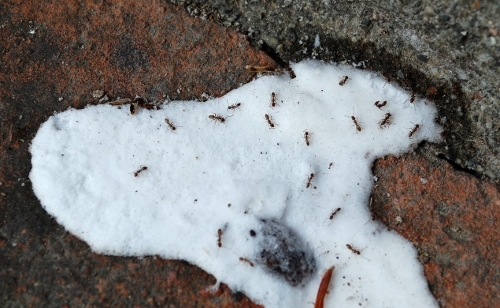 Diatomaceous Earth used for swimming pool filters snuffed the hardest nest of cut ants in Texas. One cup did it.